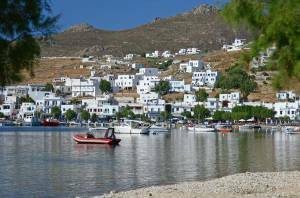 The port of Serifos is very lively as is the case in all the ports of the Cyclades, in the Aegean Sea. It features bars, restaurants, shops. Alongside there is the popular beach of Avlomonas. The image of Chora rising in the background, the fishing boats and the picturesque taverns setting tables near the sea, offer beautiful images. The seaport of Chora underwent great development between 1870-1900. Near Livadi a new settlement, called Livadakia, has recently developed, with rooms to let, small hotels and an organized beach suitable also for families. At the port, just in front of the new Marina of Serifos, you will find THETA.